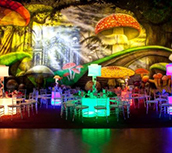 Are you planning a thematic event such as Casino Royale, Steampunk, Mardi Gras, Ooh La La Paris, Carnival, Fairytale, Hollywood, Sports, Futuristic, Winter Wonderland, Arabian Nights, Great Gatsby and so on? Do not let your party be a plain affair and lacking the atmosphere of a real bash. Allow Eventions Event Designs to bring life to your special event with our themed backdrops and murals to compliment your décor and vision. Whether you’re searching for a picturesque African safari with a vibrant sunset, a stylized palace with opulent interior, or a subdued night sky, our wall decorations will make the difference between a mundane and a memorable event. All of our backdrops and murals are custom made, flame-resistant tested and certified, and hand-painted and air brushed by expert skilled artists. We offer a variety of sizes (standard): 10'x08', 10'x10', 15'x10', 20'x10', 20'x20', 25'x10', 30'x15', 30'x20', 40'x10', 40'x20', 50'x20', and 50'x22'. However, we can custom design any size to fit your event ranging from 8’ - 50’ in width and 8’- 22’ in height and include cut outs for doors, entryways, etc. Rental prices are based on the size of the backdrop ranging from $200 to $850. Custom backdrop rental is based on the design detail and panel size with a price point starting at $600. Length of rental and budget are also factors that will determine your scenic selection. We are confident the authenticity of our scenic structures will enhance your event décor, pull your theme together, and provide a visual impact making your event unforgettable. It’s our pleasure to help make your next event production something truly extraordinary.